This detector is to be used as test unit, to measure the performance of my other project using Fluorescent Tubes against in order to clarify and identify any issues, also to better understand and to also demonstrate the principles of a cosmic ray telescope. Above is one of the first visual test of the circuit, which has been updated a number of times since this video. Although the new circuit produces less false positives and hence less flashes, the video here offers a good demonstration of what the output data looks like. The LED flash times are slowed by a one-shot timer, as the pulses are so short they would not be visible if the LEDs where driven directly. 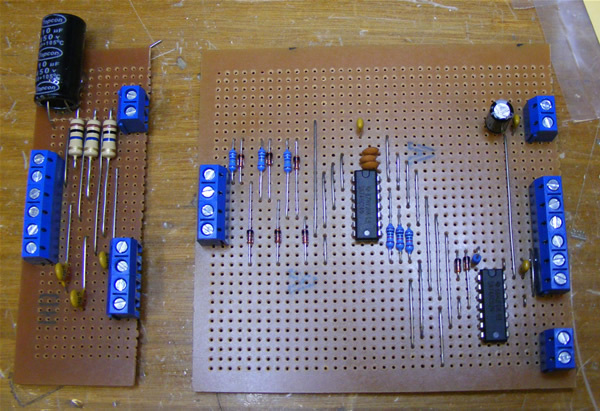 After a number of different configurations and tests, I have distilled the design down to a simple circuit seen here. The outputs 4,5,6 give a positive 5V logic pulse when a coincidence is detected in two or more of the tubes. Although Geiger–Müller tubes are sensitive to Muons, the response time to decay (Pulse Width) when a muon is detected is relatively long for measuring the probability of coincidence in two or more the tubes. This means the wider the Pulse Width the greater the number of false positives. Consequently some means of pulse shortening is required to shorten the Pulse Width to a shorter period to decrease the probability that it is terrestrial radiation hitting the tubes in close succession. The CRO trace above demonstrates what happens in this circuit when a wider pulse in feed in. The bottom trace is the output and only responds to a negative travelling pulse regardless of pulse shape. This is also important as the Geiger–Müller tube is positively biased and when a particle is detected the output swings negative, so the circuit ensures that only the first micro second of the detector pulse is processed in the coincidence circuit. Why 3 tubes? I hear you say, well it is all about increasing the detectors aperture size to muons as most Geiger–Müller tubes available are longer than they are wide. So as an attempt to achieve a larger aperture as well as coincidence detection without using rows of tubes in each layer I am combining the coincidence outputs from top-middle and middle-bottom detectors. The prototype provides six positive 5V logic outputs to a din socket. 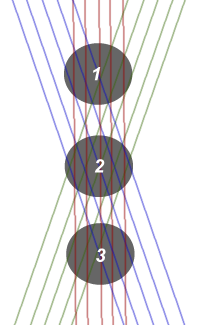 1) Top tube - all detections 2) Middle tube - all detections 3) Bottom tube - all detections (all detections) meaning both cosmic and background radiation 4) Top and Middle - coincidence detection 5) Bottom and Middle - coincidence detection 6) "Top & Middle" or "Middle & Bottom" - coincidence detection (coincidence detection) meaning a stronger likelihood of a cosmic source than terrestrial source being detected. Outputs 4 and 5 are the main outputs, but to give some visual information that the detector is working I've added some LEDs driven by one-shot timers to give a 1/8 second flash, as the output pulses are only a micro second and wouldn't be seen if used to drive the LEDs directly. 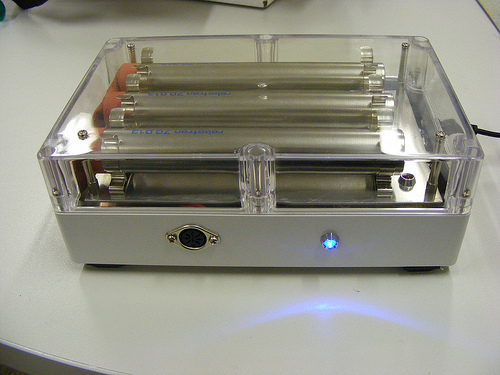 Output 6 drives the blue LED indicating a confirmed coincidence in two or more tubes and where outputs 1,2 & 3 drive the red LEDs indicating any detection in the adjacent tube. Coincidence Detection The main idea of 'coincidence detection' in signal processing is that if a detector detects a signal pulse in the midst of random noise pulses inherent in the detector, there is a certain probability, p, that the detected pulse is actually a noise pulse. But if two detectors detect the signal pulse simultaneously, the probability that it is a noise pulse in the detectors is p2. Suppose p = 0.1. Then p2 = 0.01. Thus the chance of a false detection is reduced by the use of coincidence detection.